Yummy and so delicious on a busy day! After the trick Mother Nature played on the North East last week, we have been given a wonderful treat. An absolutely gorgeous week of fall! I know it won't last long, so I've been trying to take advantage of this beautiful weather and squeeze in a lot of yard work. The early snow had caused quite a bit of damage to my plants. Many of them needed to be cut back. My garden, which has been sadly neglected, also needed to be cleaned out. I pulled the last of my carrots this morning. I've also been trying to get my house cleaned for the holidays. Washing windows and taking down screens. I'm somewhat of a dinosaur but, there is something nice about taking down those screens and letting the sun shine in! All this work has taken away any desire from me to be in the kitchen cooking. By dinnertime, I'm exhausted! Last night I sent my husband out for Chinese. Tonight I will be cooking. After all, I couldn't send him out two nights in a row. Could I? No!!! I recently found a delicious and easy to prepare Chicken Marsala recipe in last months issue of Southern Living magazine. This is the third time I have made this dish! It has gotten rave reviews from my tasters. What else could a cook want? Not to spend so much time preparing? This one gives you that too! Post Script...I thought my original post was better, but blogger decided to delete it while I was in the middle of editing! It stressed me out so much that now, I really need to rest!! Making the sauce with the mushrooms, chicken stock, and marsala. I doubled this. Add a glass of wine, some nice crusty bread and enjoy! 1.Melt 1 Tbsp. 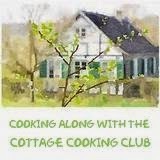 of butter in a small nonstick skillet over medium-low heat: add 2/3 cup pecans and cook, stirring often, 4 to 5 minutes or till toasted and fragrant. 2. Process flour and remaining 1/3 cup of pecans in a food processor, place mixture into a plastic bag. 3. Place chicken between 2 sheets of heavy-duty plastic wrap; flatten to 1/4-inch thickness, using a rolling pin or flat side of a meat mallet. Sprinkle with salt and pepper. Dredge in flour by shacking in plastic bag. 4. Melt remaining 2 Tbsp. butter with olive oil in a large nonstick skillet over medium-high heat; add chicken, and cook 2 to 3 minutes on each side or until golden brown and done. Remove chicken from skillet. 5. Add mushrooms and shallots to skillet; sauté 3 minutes or until mushrooms are tender. Add broth and Marsala to skillet, stirring to loosen particles from bottom of skillet. Bring mixture to a boil, reduce heat to medium, and cook, stirring occasionally, 5 minutes or until sauce is slightly thickened. Return chicken to skillet, and cook 1 to 2 minutes or until thoroughly heated. 6. 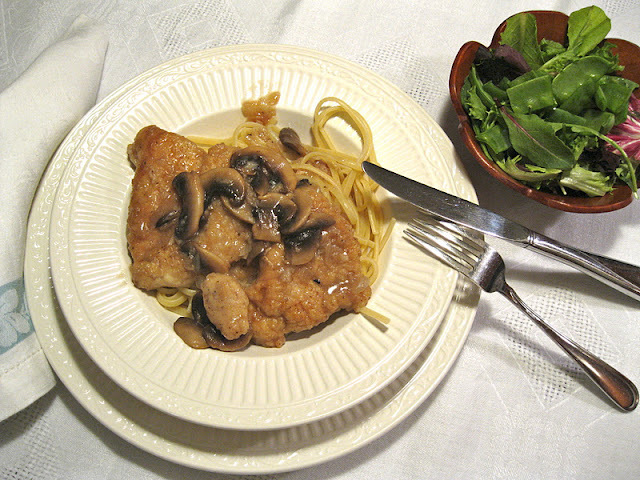 Transfer chicken to a serving platter; spoon mushroom-Marsala mixture over chicken, and sprinkle with parsley and pecans. This recipe called for pecans but since I had none in my pantry I left them out. I thought this was excellent without the pecans but will definitely try them next time. I served mine over linguini, with a nice salad and some crusty Italian bread. Delicious! Oh, this looks delicious, I will try this one soon, looks like a perfect Sunday night dinner to me! I'm not a big fan of winter, but it is rather nice to have the opportunity to cook more comforting foods and stand at the stovetop for a bit doing it. Thanksgiving will be here before we know it!! The mushrooms, oh the mushrooms! How dreamy looking! This looks and sounds wonderful! Enjoy your weekend! We're off wine tasting for a couple days. That looks so good!! I am going to have to make this one soon! First, I'm SO that you lost your post! That had to be maddening!! I know how much work goes into one especially during an already busy week! Now, this looks incredible! 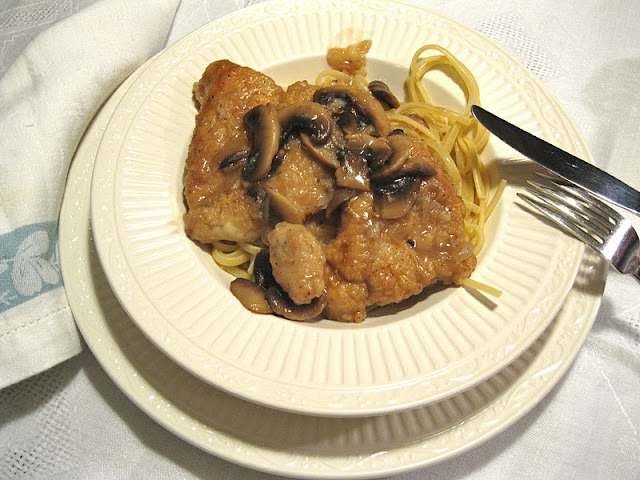 I love Chicken Marsala and love that this is easy to boot! It looks delicious in the pictures especially with all of those beautiful sauteing mushrooms! Can't wait to make this!! I saw this in Southern Living, Kathy, and marked it. I'm so glad you made it and it is good to know that you loved it so much that you have made it 3 times already! It looks fantastic and I am definitely going to make it soon. Good for you for getting started on the holiday cleaning. I hope to do some of that as this is a long holiday weekend for me. Hi, Kathy! I just wanted to let you know that I made this for dinner last night and everyone loved it! I served it with roasted vegetables last night, but we enjoyed it so much that we are having leftovers with rice and peas tonight. I am so glad you shared with us how much you liked this recipe. You always wonder when you see them in magazines and you tear them out, but don't get around to trying them. Have a great Thanksgiving!